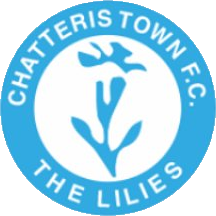 Chatteris Town were founded in 1920 as Chatteris Town Juniors, changing to the current name the following year. They initially joined the Isle of Ely League, quickly rising through its divisions and winning the title in 1923, before joining Division 2 of the Cambridgeshire County League in 1924. They continued to steadily rise through the divisions before transferring to the Peterborough & District League after winning the Cambridgeshire County League at the end of the 1931/32 season. In 1935, the club was hit by financial problems and forced to withdraw from the league. However, they reformed in 1936 as a junior team, joining and winning Division 1B of the Cambridgeshire League at the first attempt. After the war, the club returned to the Peterborough & District League, winning a hat-trick of titles from 1964 to 1966. The third of these title wins was enough for the club to be promoted to the Eastern Counties League. The club remained in the Eastern Counties League for the rest of the century, being placed in its Premier Division when Division 1 was created for the start of the 1988/89 season. 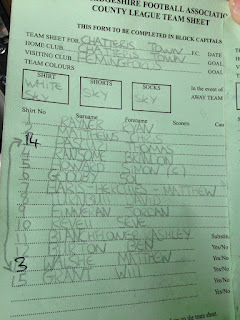 This was the beginning of the club's difficulties, with two bottom-placed finishes in the first three seasons of the Premier Division (on both occasions they were reprieved due to clubs being promoted to the Southern League or kicked out of Division 1 for not meeting the ground grading criteria). However, when they finished bottom again at the end of the 1994/95 season, there was no reprieve and they were relegated to Division 1. The club spent the next six seasons in Division 1, recording their highest finish of 5th at the end of the 2000/01 season. Despite this, the club withdrew from the league at the end of the season and dropped back into the Peterborough & District League, before transferring to Senior Division B of the Cambridgeshire County League in 2008. They finished 3rd in this league in their first season to earn promotion, and then won Senior Division A the following season to earn promotion to the Premier Division. Relegation back to Senior Division A came at the end of the 2012/13 season, but the club returned to the Premier Division at the end of the 2015/16 season. They have remained in the Premier Division ever since, but are currently looking on course to suffer relegation back to Senior Division A at the end of the season. In the FA Cup - a competition which the club have not competed in since the 1994/95 season - Chatteris have progressed as far as the 3rd Qualifying Round on two occasions: in the 1946/47 season, they received a bye to the 2nd Qualifying Round, where they beat Newmarket Town before losing to Cambridge Town; in the 1972/73 season, they beat Gorleston and Wisbech Town before losing to Ely City in a replay. 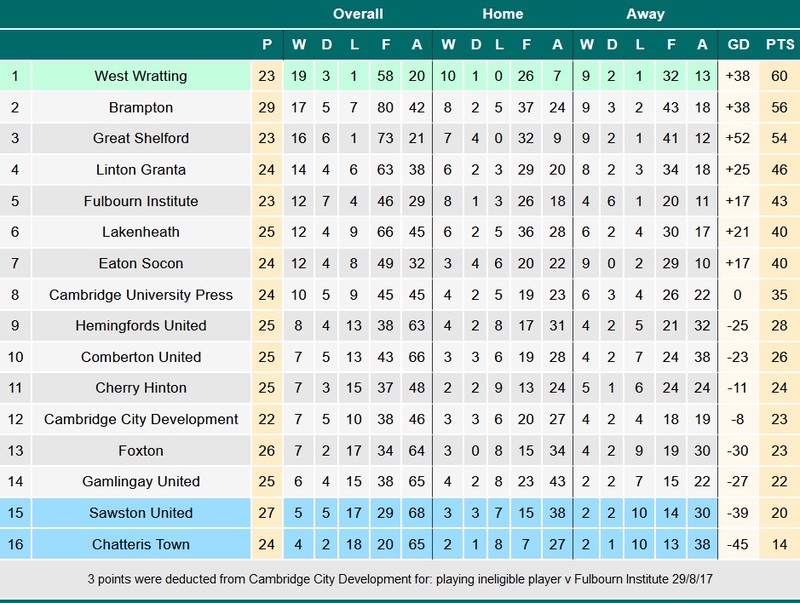 As for the FA Vase - which the club last competed in back in the 2000/01 season - Chatteris progressed as far as the 2nd Round in the 1993/94 season, beating Stamford and Armitage '90 before losing to Bridgnorth Town. After the postponements over the Easter Weekend, I had only done one of three groundhops that I had hoped to do before heading back to University for the final month of my first year. As such, I needed to fit in two games as soon as possible. However, because I was at home and did not need to worry about many of the expenses I have at University, I had been slightly less careful with my spending than normal and was very low on money as a result. Because of this, it became necessary for me to look at Step 7 and below for the second of the three groundhops I wanted to do while at home. Initially, I was hoping that Warboys Town would be at home, as it's one of the more local Step 7 options that is more than just a pitch. However, a quick look at the fixture list after the Easter Monday visit to Grantham showed that their last home game of the season was the 7th of April, meaning that I had to rule that one out. 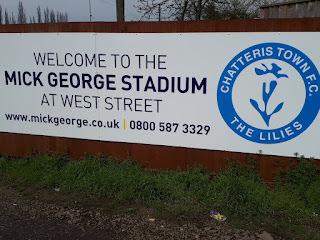 I started to think about other grounds in the local area that could fit the bill and, upon doing so, I remember that Chatteris have a very nice ground for Step 7 and, upon looking at their fixture list on NonLeagueMatters, I found that they were at home, which was highly convenient for me. Of course, after asking for and receiving approval of the plan from my mum, it then became a matter of hoping that the weather improved and that the game actually went ahead. Fortunately for me, the weather had been fairly cooperative for once, with it being sunny for what felt like (and probably was) the first time in months yesterday. With no worries about a postponement, we set off just after 1pm (with the game being a 2pm kick-off, this was an ideal time to leave), using the same back-roads we had used when heading to Ely City's ground around this time last year and arriving at the ground at around 1:35pm. I headed in through the gate and paid £2 for admission before doing the usual circuit of photos, settling next to the main stand as kick-off approached. Shortly after kick-off, I was pleasantly surprised to see Yaxley full-back/winger Jack Saunders in attendance as well, as part of an impressive 90-plus crowd. Looking at the table and records of each side, I was expecting a scrappy, low-quality contest with only a goal or two in it, while at the same time I was hoping for an exciting match despite those concerns. The early stages of the game were largely what I was expecting, with both sides trying to gain a foothold in the match but neither looking particularly likely to actually produce anything; everyone on both sides was pressing hard and giving no one any room to really produce anything. However, this changed when Hemingfords scored their first after 14 minutes (slightly against the run of play at that point, I thought, as Chatteris had just produced a couple of good chances at this point), Jack Jefferson getting a shot away from the edge of the box to score. Chatteris were quick to respond though, Matt Harris-Hercules producing an equaliser four minutes later with a driven shot from distance (a goal which I actually missed due to doing an initial headcount, but fortunately the Chatteris Twitter promptly posted the details of the goal). At this point - and for most of the match, in all honesty - there wasn't much of a pattern to the play, with both teams seeming to largely forego tactics in favour of simply trying to get the ball forward and into the net. This meant that there wasn't much in the way of nuanced play (to the point where it's proven quite difficult to write a lengthy report on this game), but the simplicity was definitely refreshing, even if there were plenty of mistakes from both sides because of it (although that is to be expected considering where these teams are in the league). In any event, the half continued as it was for a while - both teams pushing forwards and creating chances before being pushed back again - until a third goal came on 35 minutes in bizarre fashion: Chatteris had played the ball forwards and into the box and it seemed to be heading towards the Hemingfords goalkeeper for an easy save, only for one of the defenders to head past him into the empty net. While it was baffling how it actually came about, Chatteris did deserve their lead at this stage, having produced a few more chances than the away side and generally had the better of the play since their equaliser. The rest of the half saw Hemingfords push for an equaliser while Chatteris pushed for a third, but no further goals came before half-time. 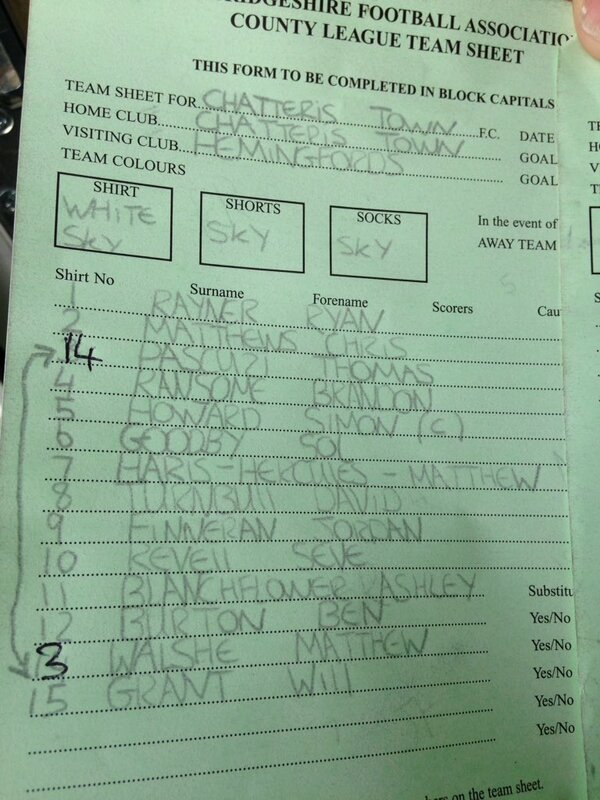 2-1 to Chatteris Town at half-time. During the half-time break, while I was in the clubhouse getting myself a burger, the Hemingfords manager was holding his team talk on the pitch, understandably unhappy with how things had progressed for his side throughout the first half. However, if he was unhappy then he would have been livid with how his side started the second half: just 5 minutes into the half, a defensive mix-up saw what should have been a comfortable clearance for the goalkeeper instead ricochet towards the goal to almost increase Chatteris' lead, only for one of the defenders to scramble clear. The home side continued on the front foot for a while after this, producing chance after chance - many courtesy of the runs down the wings from Harris-Hercules and Ashley Blanchflower - but not being able to get a third. As such, I thought that there was a good chance Hemingfords would punish them for their inability to increase the lead, but for a while it looked as if the home defence would hold firm, even if they were mainly getting through by bringing almost everyone back to defend. A particularly notable chance came just after the hour mark where Harris-Hercules was able to win the ball off the Hemingfords goalkeeper from about 35 yards out (goodness knows what he was doing that far out of goal) and could have scored, but the goalkeeper and defence were eventually able to force him off the ball to avoid further embarrassment. However, the away side did eventually equalise on 75 minutes with an excellent goal, Jack Jefferson lobbing the ball over Chatteris goalkeeper Ryan Rayner to score from a very tight angle. This goal had a dramatic effect on both sides, revitalising a frustrated Hemingfords side but seeming to crush the confidence of the Chatteris players. This became obvious very quickly as Hemingfords instantly charged forwards again while the Chatteris defenders, who had been hassling and harrying the Hemingfords attackers all game, were no longer doing so with the same urgency, giving the away side much more freedom to play. As such, it was unsurprising when they scored again four minutes later, Will Greatorex able to tap in unmarked from close range after a cross was not dealt with. The away side then scored again three minutes later, former Chatteris player Lily Parmenter receiving a cross unmarked and then shooting from just inside the box to score. Hemingfords could have then scored a couple more before the game finished, but no further goals materialised and so it finished 2-4. Overall, this was an entertaining contest between two sides who both looked better than their positions would suggest, with the game largely able to flow without incident (less so in the second half than the first, but even then there weren't many stoppages). In the end, Hemingfords did deserve the three points, but at the same time Chatteris should have secured at least one point considering the position they were in. However, as is understandable for a team bottom of the league, they just seemed to run out of steam and lose all confidence in the last 15 minutes and ended up caving in as a result. 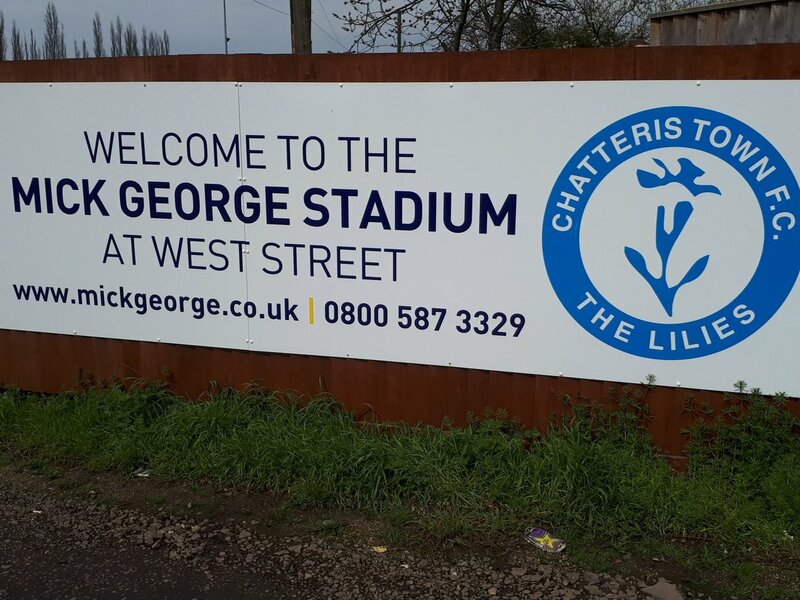 It's looking likely that Chatteris will be relegated at the end of the season, and if that does occur I would hope that they are able to rebuild as a result, as they're very well-supported for this level and have a great ground for it as well. Overall, this was another highly enjoyable groundhop, with an entertaining match (the most goals I've seen in a game in 2018 so far), excellent ground and friendly club, with the only slight disappointment being the burger I had at half-time (although perhaps I've raised my expectations overly high after how good the food was at Grantham). Still, that wasn't close to enough to put a damper on a great day, and I would seriously recommend anyone who hasn't visited this ground to do so whenever they can. With this being my 22nd new ground of the season (I've now doubled the number of grounds I've visited in the space of one season), I'm now aiming to do just three more before the season ends, as ending the season on 25 new grounds visited will be very satisfying. My plans for my last three grounds of the season are as follows: first, I'm aiming to visit Eynesbury Rovers this coming Thursday to watch Yaxley play there, then I'm going to go somewhere further afield from University on the 28th (I haven't thought about where yet, but I'll start investigating in due course) and then I'll be finishing with Yaxley's cup final at Raunds Town on the 7th of May. West Street is one of the hidden gems at Step 7 and below, with an impressive 250-seater main stand on the dugout side, a small covered standing area directly across from that (probably able to hold 100 or so people at most) and some additional cover behind the near goal, courtesy of overhangs from the clubhouse and changing room roofs. The pitch is almost fully railed, with only a few areas at the far end not railed off, although some of the railing is starting to falling apart. There's hard standing behind the near goal and along each side up to the respective stands, but everything after this is grass. There is also a second pitch behind the main stand. Everything at the ground is in the club's colours, which makes it feel much more unique and homely than it otherwise would. The ground has an overall capacity of 2,000, a level which was once reached back in May 1988 for a local derby against March Town United. Also of interest, West Ham United used this as their base during World War 2, when they were understandably unable to play in London. As it is, this is an excellent ground for Step 7 and, given that it has working floodlights as well, it would also be a fine addition to Step 6 should the club ever be in a position to return to that level in the future; some work would be needed in that scenario, mainly minor touches such as adding a pay box to take admission or fixing the broken railing. 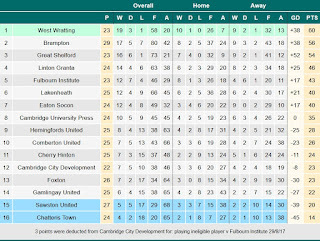 However, that's likely a long way off, but until then West Street will be one of the best grounds below Step 7 from next season, should Chatteris be relegated at the end of the season as currently appears likely.